The 1907 Love Trophies Egg, also known as "Cradle with Garlands Egg", is made of varicolored gold, translucent pale blue and green enamel, opalescent oyster enamel, diamonds, rubies, pearls, white onyx and silk-lining. The now missing surprise* is described on the invoice and reads: "a white enamel easel with one ruby, pearls and rose-cut diamonds, one miniature of the Imperial Children". [Fabergé, Proler, Skurlov, The Fabergé Imperial Easter Eggs, 1997, 246]. 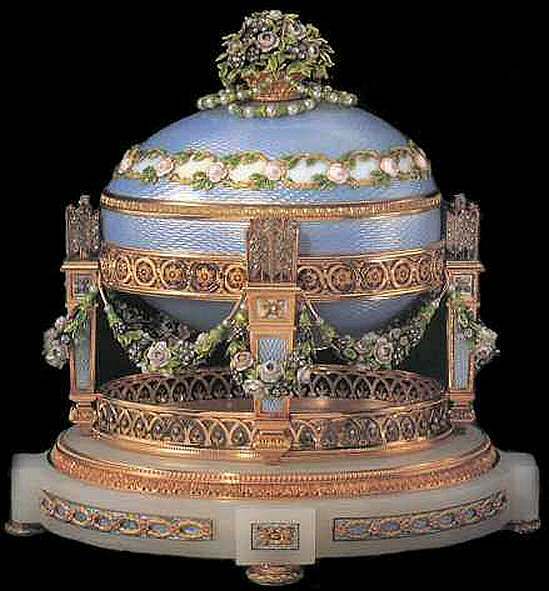 This gold Egg in the Louis XVI style, is enameled translucent pale blue and decorated with a band composed of painted enamel roses and translucent emerald green enameled leaves, panels of oyster enamel and bands of scrolls and acanthus in colored gold. The Egg is supported in a gold cradle by four columns modeled as love trophies with Cupid's sets of arrows set with diamonds. The whole is supported on a carved oval white onyx base and stands on four bun feet in chased colored gold. The Egg, seen only a very few times since it was brought to the West, was a source of controversy for fifty years. The questions were; who received it, when, and what was the surprise. The Egg appearing at the 1989 San Diego Exhibition settled one question; the gold marks proved that it was made before the hallmarking changed in 1908. New evidence in 1979 proved the Egg was made in 1907 for the Dowager Empress Maria Feodorovna. 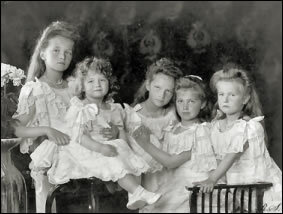 According to the original invoice the surprise was a miniature of all the imperial children. The Love Trophies Egg was designed by Henrik Wigström, Fabergé's Head Workmaster from 1903 to 1918. Wigström's career began in 1886, when he started working in one of Fabergé's workshops as apprentice to Mikhail Perkhin. In 1903, he succeeded Perkhin as Head Workmaster to Fabergé, creating some of the finest treasures the world has ever known. How the Egg came to the West is not exactly known, probably through the Hammer Galleries and their Russian connections. 1930 - 1962 whereabouts unknown. 1989 in a private collection in the United States. Sold by Sotheby's New York from a private US collection to an anonymous US buyer.